The Orange County Farm Bureau recently held its annual Membership Dinner at the Central Florida Fairgrounds. The event recognizes the contributions of local farmers and ranchers in the region. Orange County Mayor Teresa Jacobs, Orange County District 1 Commissioner S. Scott Boyd, Orange County District 2 Commissioner Bryan Nelson, Congressman John L. Mica and other elected officials attended the event to show their longstanding support for the region’s agricultural community. During the dinner, the Bureau’s board of directors provided an update on the nursery industry, agricultural lending and industry needs. Local farmers and ranchers provide invaluable contributions to the Central Florida economy and community. The Orange County Farm Bureau strives to ensure the County’s agriculture sector remains competitive while also promoting environmental stewardship and fostering mentorships for students studying agriculture. The Orange County Farm Bureau assists in upholding the state’s reputation as a national leader in the agriculture and farming sector and is a part of the Florida Farm Bureau Federation (FFBF). FFBF was founded to promote and protect the agricultural interests of farmers and ranchers as they work to responsibly provide an abundant food supply using Florida’s natural resources. As of 2015, more than 155,000 jobs in Orange County are related to agriculture, according to a study by the University of Florida. Studies show that nearly 18 percent of Orange County residents work in an agriculture-related field, including those producing and processing food goods. Orange County, specifically West Orange County, is a citrus industry leader. West Orange County’s viable and robust agricultural sector propelled Orange County forward as an industry leader in agriculture. Orange County’s citrus industry is ranked number 19 in the state, and its nursery, greenhouse, floriculture and sod industry is ranked second in the state and fifth in the nation. 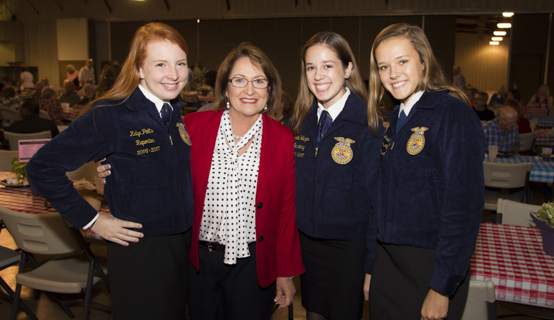 To view photos from the Orange County Farm Bureau’s Membership Dinner, visit Mayor Jacobs’ Flickr album.